Tiny houses are great! They offer financial freedom, mobility and more time to spend doing the things you love! So why isn’t everyone going tiny? There are some hurdles to living in a tiny house that we would be remiss not to address. Unfortunately, even though there is overwhelming support and interest in tiny homes, it still isn’t easy to legally live in them full-time. Zoning Regulations – Zoning determines the size requirements of your home based on what zone it is located in. You will need to contact your local zoning or planning department to find that information. Many municipalities have a minimum habitable structure definition, meaning you can’t live full-time in a dwelling that is under “x” amount of square feet, typically 1,000 or more. Building Codes – Building, or construction codes, tell you how to build your house. The International Building Code (IRC)is where most of the country’s local building codes have been adopted from. These codes are typically for one- and two-family dwellings and contains size specifications for rooms (except bathrooms & kitchens). For example, rooms must be at least 70 square feet, while ceiling height must be 7 feet. 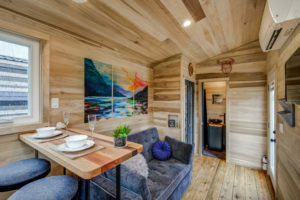 Social Pressures – Even with the popularity of tiny houses, many people are intimidated to tell family members and friends that they want to live in or build one. There is a social stigma against not “keeping up with the Jones’” and a bigger house = success to many people, so it can understandably be frightening to announce to everyone that you want to downsize. 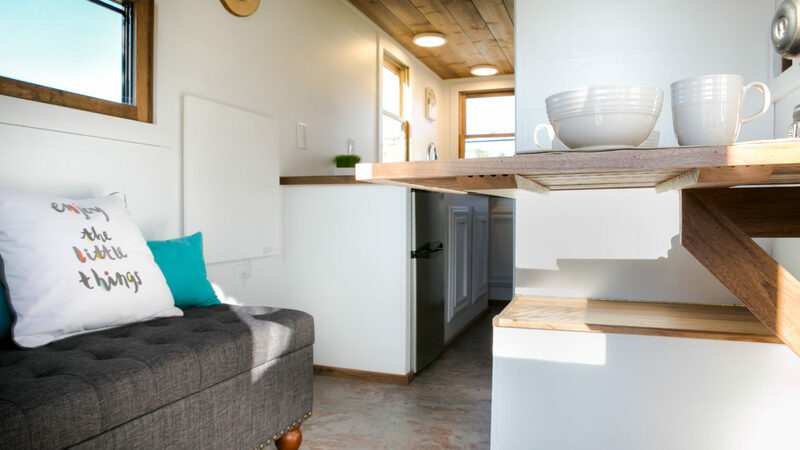 Also, there is a lot of research that needs to go into planning for your tiny home, which can be daunting to those that do not wish to talk to their government officials and spend time discerning local building and zoning codes. Don’t worry though, it isn’t all doom & gloom. 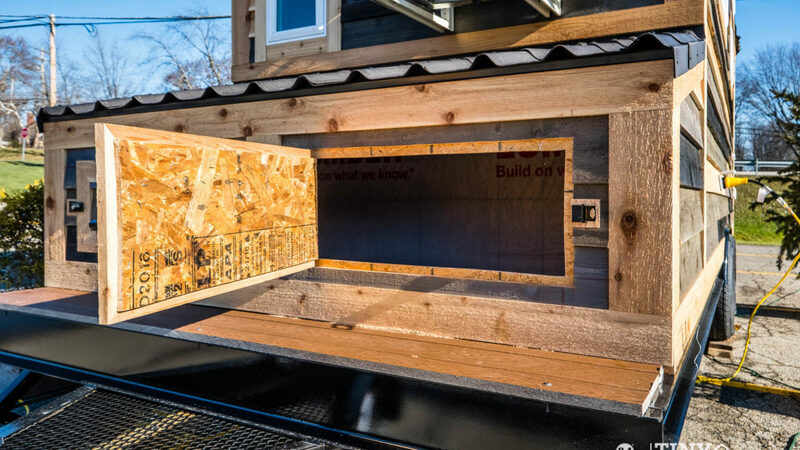 There is a lot of momentum behind the tiny house movement and it doesn’t seem to be slowing down at all. 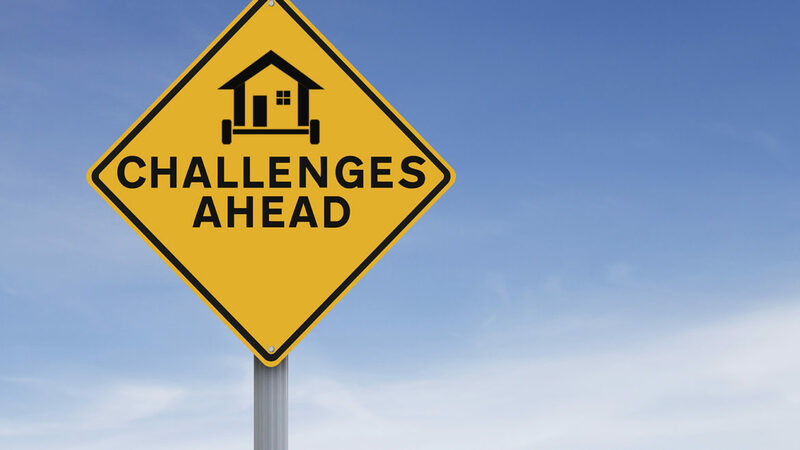 Check back next month for Part 2 – how to find your way around these roadblocks. 7 Reasons why you should attend a trade show. When our tiny living team decides to take a tiny house to a show there are many questions we must answer first. We want to be sure that we will be able to make an impact on those that are attending in a positive way. We realize that you have paid money and may have traveled to attend, so we want to give you the best bang for your buck. A lot of these shows are massive and can be intimidating for a first-time (and even repeat) attendee, but don’t let that stop you! Here are just 7 reasons why going to a show, and getting the most out of it, is beneficial to you. You get to see the product in person. Nothing beats actually getting to witness a product in real life. Descriptions can only take you so far, but to be able to touch and see the product in question will make your decision much more informed. Build relationships. Network with other like-minded individuals. This is a great way to meet people that share your interests. Meet the experts. This is the perfect time to have immediate communication with the people that know the product best! A FAQ on a website can only get you so far; at a show you have the advantage of being able to talk face to face with someone and get comprehensive information and answers to your questions. Educational and networking programs. These are a great way to increase your expertise and share experiences. You can ask questions and learn the why behind other people’s decisions, which can prevent you from repeating their mistakes. Stimulate new ideas. Maybe you will find or see something that you never thought of before. You can see someone else’s way of doing something and mold it to work for you. Special deals. Many trade show booths will offer special deals while you are at the show. For example, we are giving away a free set of plans and 10% off materials, all you need is a valid email address to enter. Many times we will also offer a special discounted price on our model houses. Make a plan and have fun! Remember, you are there to gain insight and see some creative products. If you have a limited schedule, plan beforehand what seminars you want to participate in and what booths are a ‘must see’ for you. Try not to get frustrated if there is a line, instead, start a conversation. You never know who you will meet or what you can learn! 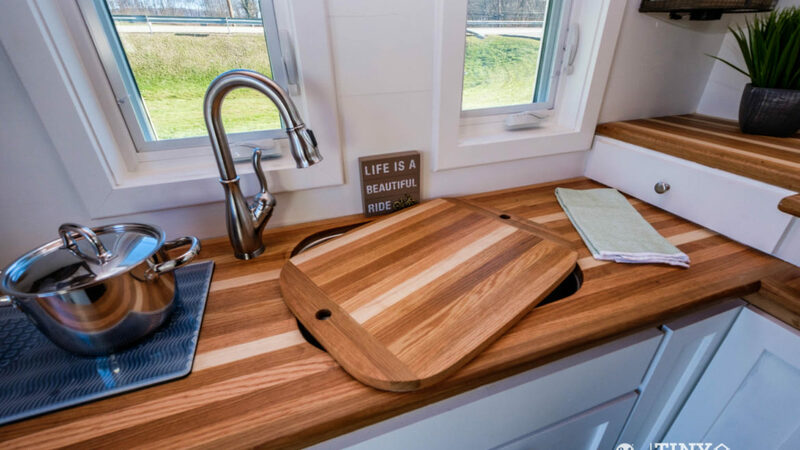 We will be at the Tiny House & Simple Living Jamboree in Austin, TX August 24th-26th and at the Mother Earth News Fair in Seven Springs, PA September 14th-16th. Stop by and say hi if you are in the area! Who is buying a tiny house? The typical tiny house customer cannot be confined to a certain box. In our experience, there is not one overwhelming age group or profession that prefers the lifestyle, so that question can be difficult to answer. Another factor to note that the MicroLife Institute found is that this interest to live tiny doesn’t seem to strictly pertain to just one profession. 26% of those that participated in the survey were hourly, 41% are salaried, 11% are contract workers, 9% are retired and the remaining 12% fall under the unpaid/volunteer/other category. What both of these surveys show us is that there are aspects of tiny living that speak to people of each age group on some sort of level. For example, those that are nearing retirement or are retired look at it as a way to stretch out their fixed income, as well as the fact that they will be living in a small space that doesn’t require much maintenance. Also, considering that those aged 20-39 are still grappling with the effects of the recession, they don’t want to add to the debt that they already carry. Taking on a mortgage is a large deterrent to all of those age groups surveyed, but especially with those that are dealing with student loan debt. Many tiny house dwellers view their home as a means to an end, a way to make their home work for them as opposed to working for their home. In this way they can live their lives in a way that best suits them. Whatever the age or profession, we love hearing the reasons for wanting to go tiny. This allows us to get to know our homeowners better and build houses that make sense for them. 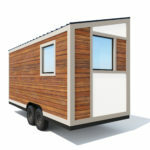 Would you consider living full-time in a tiny house on wheels? What about it appeals to you? Welcome to the Degsy! 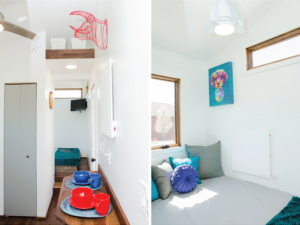 Our contemporary tiny home got a facelift and we are so excited to unveil it to you! This house features several custom designs brought to you by our 84 Custom Millwork Shop, Sign Shop, and one of the artists that we have here on staff. When you walk inside you will notice that we were able to keep this house all one level but opened it up to be more spacious. We also kept the contemporary design and the large windows to provide plenty of natural sunlight. However, instead of painting the walls, as we typically do, we left them natural. We also added more seating for work or relaxation, and a large, custom closet. 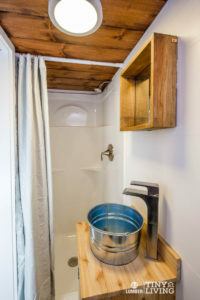 The bathroom was also enlarged, and custom shelving was added for more storage. Pictures certainly don’t do it justice. Come check it out for yourself! It, as well as our other three models, are on display at 84 Lumber Team Headquarters M-F 7am-5pm. One of the questions that we frequently get is how our houses hold up while traveling with them. Since we began hauling them around in February of 2016 we have put over 30,000 miles on our tiny houses. They have visited 20 different states in the US and were shown at 44 different events, with well over 20,000 people walking through them, so you could say that we have some experience. 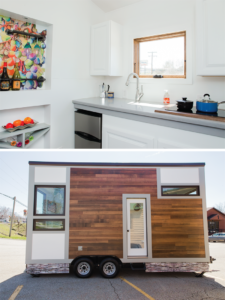 When we created the 84 Tiny Living program we wanted to stay true to the tiny house on wheels (THOW) concept and were careful to design each house to be transported easily. The materials that we use were chosen specifically for the purpose of travel and with the least amount of maintenance as possible. For example, because there is a possibility of losing shingles while traveling we use metal or composite roofing. Also, our screens are on the inside of the windows, instead of on the outside, to prevent losing them on the road. Something else you need to consider are the dimensions of your THOW. All of our tiny houses are towable with a ¾ ton truck and fall under the necessary specifications for traveling with a camper or trailer. All of this means that you do not need any type of special license or permits to move them, and allows you, as the owner, the ability to pick up and go whenever you need to. The logistics of traveling with your 84 Tiny House only become complicated by what you own or add to your home. Everything needs to be secured when traveling to prevent damage. 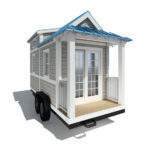 This generally doesn’t take a lot of time to do, I can usually secure our tiny house models in about 15 minutes when we travel with them, but it is something that you need to be aware of. We also do a walkaround of our houses to ensure that none of the siding is loose, the tires have enough air pressure, all of the windows and doors are locked, etc. Once the house is ready for travel, it’s a simple hook up onto the truck and away we go! Do you have any experience traveling with your house? Let us know below what your biggest concerns are or what you love about being able to travel with your home. We have 3 more events confirmed on our calendar this year, which will add another state to the above list, and several more that we are still considering. We’d love to see you at one of our stops! 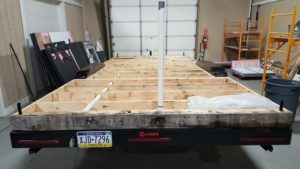 As we are finishing up the build of our new Degsy Tiny House, I thought it would be a perfect time to share with you all just how exactly our tiny houses come together. Currently all of them are built in Eighty-Four, PA at 84 Lumber Headquarters. Each house is truly a team effort and consists of designers, architects, engineers, general contractors, our millwork shop and sign shop associates and our marketing team. 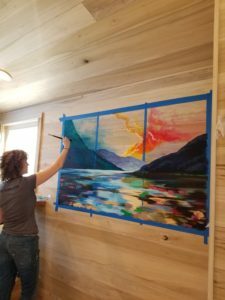 As with any house build, and possibly even more so with tiny houses, there are a lot of changes that tend to happen on the fly and cooperation among everyone involved is very important. But before we even start building there is a ton of work and planning that happens. It starts with our Customers, Designers and Developers. When working on a new design, we work hard to build in efficiencies and details that our customers will benefit from. Trust me on this one, we have a reason for every design decision that we make. If you have a question on why we use certain materials, or why we placed a feature where we did, feel free to ask. 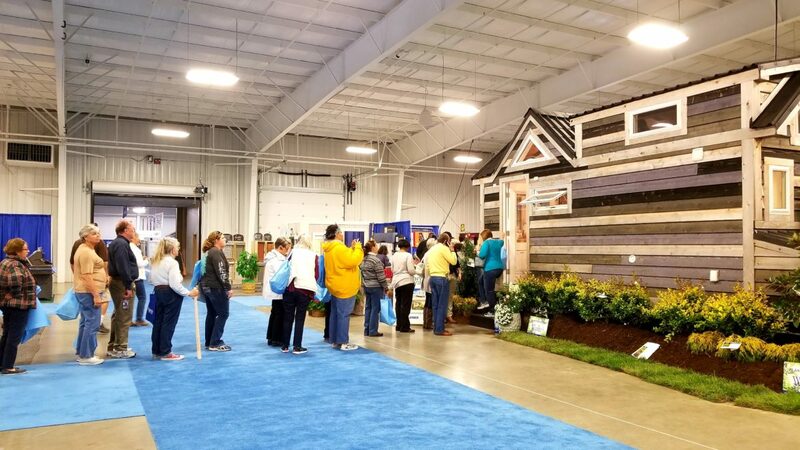 At 84 Tiny Living our designers and developers have a tendency to be on the road, visiting with customers and showing off our tiny homes at shows and at some of our stores (so if you are a fan, be sure to say hi and tell us what you like, we love hearing from you!). We listen to every compliment and criticism and adjust our designs when it makes sense (and still keeps our houses safe and efficient). Once we have a rough design on paper, we move on to the next phase: Engineering and Architectural Design. This could arguably be the most important part of the whole process. 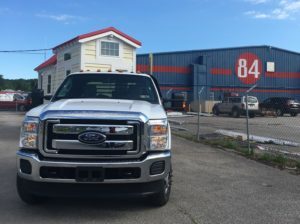 At 84 Tiny Living we take great pride in the product that we are putting out, so we work hard to ensure that it is as safe and efficient as possible. Our team of engineers and architects work together to make this happen, from our trailer specifications to the peak of each house. We then take the resulting prints to our builders and let them get to work. If the Engineering phase is the most important, then the Build process is the most fun. It’s during this time that we get to see our ideas come to life. Our general contractors, and associates at our millwork shop and sign shop all play a pivotal role in the build of each of our houses. The crew does a great job of working with our designers to put together our vision, all while making adjustments along the way. 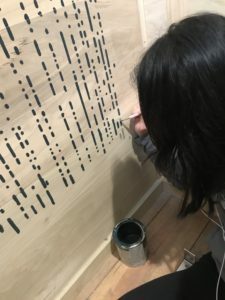 And while our builders are physically putting the pieces together, our custom millwork shop and sign shop turn our unique ideas into tangible, head-turning features, that our builders then install. Once our houses are built, it’s time for the Marketing team to swoop in and share the final product with you all! In collaboration with our designers and sign shop, the marketing team does a fantastic job of putting together all of the materials, photos, posts, brochures, etc. to get the word out and show off the final product. 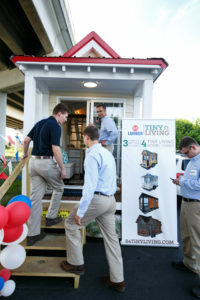 Lastly, our store associates and sales team come together to present the tiny houses to our customer base. They are working directly with our customers to make sure that they get exactly what they are looking for at the best price. This is just a slight overview (and shout out) to all of the amazing team members that we have on staff at 84 Tiny Living and 84 Lumber. It’s also just a snapshot of what everyone does to move this company forward. If you are interested in more information on any part of the team, reach out to us through the Contact Us link or on any of our social media sites. “What is a tiny house?” is a question that I get asked all of the time. Along with, “Why would someone want to live in one?”. The best debates happen when we are on the road, giving tours, and we get 2 or more people in the house that can talk about the pros and cons of living the tiny house lifestyle. Someone who isn’t familiar with the concept, talking to someone that is well-versed in the lifestyle, can result in a very informative and open discussion. Unfortunately, not everyone has the opportunity to witness such a dialogue, so I wanted to address it in our monthly blog. To answer the first question, a tiny house is exactly what the name states. 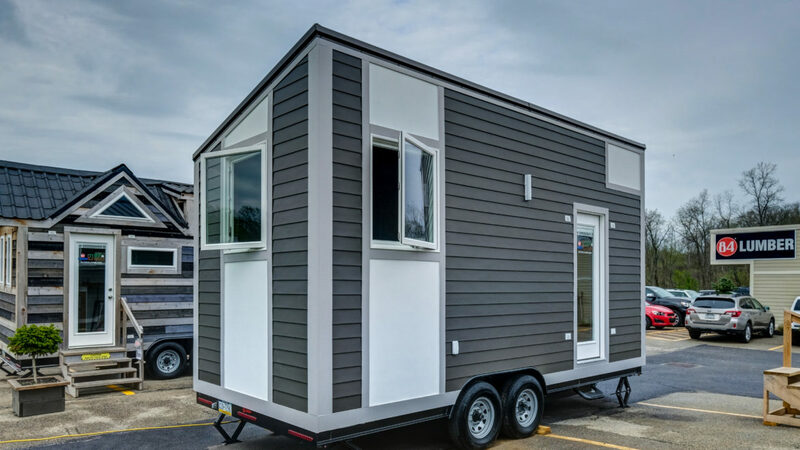 It is a house that is shrunk down substantially from the average 2,600 square foot American home to 200 square feet or less and has the added bonus of being on wheels. 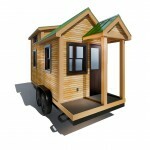 There is nothing that is missing from one of our THOWs (Tiny House on Wheels). They all have kitchens with stove tops and refrigerators. They all have bathrooms with showers & toilets. They all have living and sleeping spaces. It’s everything that you would have in a typical home, just on a smaller scale. Living in a tiny house does not mean that you have to skimp on any comforts. You can still have Low-E windows, LED lighting, water conserving faucets, and any other designer finish you want. The next question, ‘why or who would choose to live in one’, is a bit more difficult to answer. The reasons people have to live tiny, are as different as the individual themselves. At 84 Tiny Living all of our houses are specifically designed and engineered to be built on trailers. 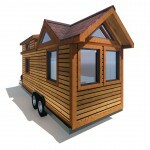 This enables the customer to haul their house and place it wherever they would like. This can be especially useful for those that travel often for work and don’t want to stay in hotels, or for those that can work from anywhere and prefer to travel while doing it, or for those that are retired and like to live in different parts of the country during different times of the year. Many individuals embrace the lifestyle for the freedom it offers, whether it be from a mortgage, maintenance, or minimalistic perspective. I invite you to share your reasons for ‘living tiny’ below! Mine are freedom from clutter and the ability to spend more time doing the things that I enjoy as opposed to maintaining something that I don’t even get to spend that much time in. Our original, one-of-a-kind Degsy has SOLD! 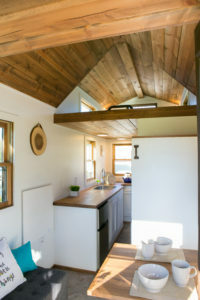 The Degsy is a unique and contemporary tiny house, and our only model that features a one-level design. Our first design included two bedrooms on either end of the house, and the kitchen, dining area and bathroom in the middle. After showing this design at different events, we discovered that it wasn’t the best we could do. 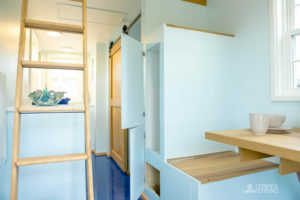 Many of our visitors did not see the need for the two separate bedrooms and felt that it made the space feel even smaller and more compact than what it is. So, after hearing input from our tiny house community and after much consideration, we decided to give the Degsy a complete interior re-design. But before we get into that, here is a snapshot of the new owner of the original Degsy. Brad is an active duty member of the U.S. Army and has served for 11 years (Thank you!!). Because of this dedication to our country, he typically moves every two to three years. 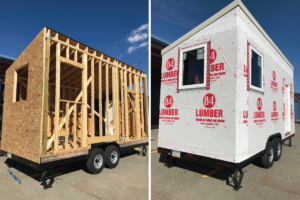 He said “the ability to live in a fully functional home that can be easily moved for a fraction of the cost of a traditional home,” as well as affordability, were the top two reasons why he decided to buy a tiny house. In fact, these two motives frequently top the list of reasons why people decide to go tiny. 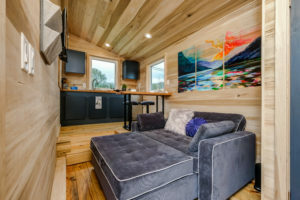 The idea of not being tied down to a mortgage and being able to move freely when it’s needed or wanted appeals to many in the tiny house community. Brad plans to use the house for full-time living. His job does require him to travel frequently, however, so when that is the case, he is looking to rent it out to those who are interested in a getaway. When he retires, he wants to use it as a luxury RV for both camping and tailgating at sporting events. Brad stated that he was especially happy about buying the model turn-key and being able to immediately have a comfortable, safe and attractive place to live. We were very excited to meet Brad and to be a part of his journey to tiny! And now it’s out with the old and in with the new! We’ve begun building our new Degsy. If you haven’t already, be sure to subscribe to our monthly newsletter and follow us on all of our social media channels (@84TinyLiving) to get updates on the build. 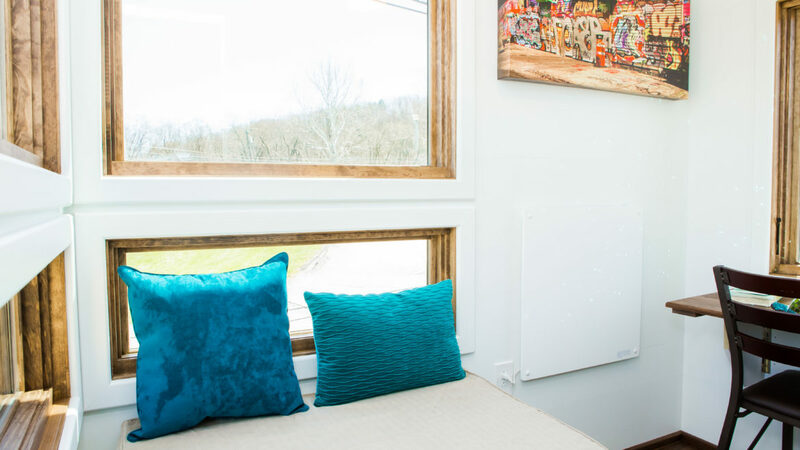 Living tiny may not be for everyone, but if it’s something that you are considering, I invite you to take a tour of the models that we have on display in Eighty Four, PA. The Roving, Shonsie and Countryside displays are still available for purchase. Please contact us if you have any questions or interest! As someone who works in the tiny house industry, one of the questions that I get the most is, “Where do you put all of your stuff?”. 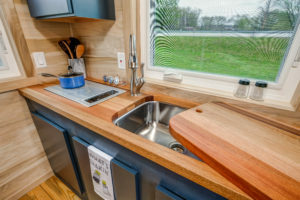 This is the major struggle that most people seem to have with tiny houses (yes, even more than the composting toilet). But with a little ingenuity and creativity, even 154 square feet can feel like a much larger space. We all know that you need less stuff to live in a tiny house, but perhaps you can pare down a little more. I know, I know, you’ve already gotten rid of so much, but hear me out. Items like extra cutlery or cooking tools that you keep around just in case are not necessary. Have you used them in the last three months? Do you have an event happening in the next three months that you will need them for? If your answer is “no,” get rid of them. Not only does this physically clear up space, but the less clutter you see in your house, the more open it will feel. In such a small space, almost everything should have more than one use. 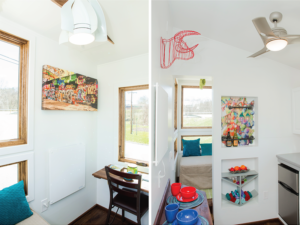 In 84 Tiny Living houses, we build in as much storage as we can while keeping the structural integrity of the house. 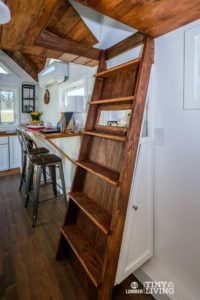 For example, the picture below shows how the stairs in our Countryside model also have two areas for storage built into it — one closet and a shelf above it. Corner shelves can also be multi-purpose as many of them make cool conversation pieces. They also act as a way to display your items (and keep them off of the floor or countertop). Have wall space? Add a shelf or cabinet. Keep in mind that an open shelf gives the illusion of more space, but if you are someone who travels with your tiny house, a glass cabinet door may be helpful to keep everything in its spot. A DIY ceiling-hanging clothing rack made from a pipe or bamboo dowel rod and some chain or rope is a purposeful and an efficient use of space. Don’t want to mount a TV, but still want the option to watch movies or a show in your tiny house? Buy a white screen that doubles as a blind for your windows and a projector. A ladder in the dead space behind your door makes for a great decorative rack to hang blankets or other items from. Or you can build a vertical shoe rack there that will help you, and your guests, remember to take your shoes off as you enter the house. A simple mesh holder that hangs from your shower curtain can save space while keeping everything tidy and in one place. Over-the-door racks or interior organizers on your cabinets are great for smaller items that you don’t want to lose in your cupboard. A well-placed mirror always helps; reflective surfaces give the impression of more light in a space. These are just a few ideas that you can use. Do you have experience living in a tiny space or have other ideas? Share them with us below! We’re counting down the days until Christmas here at 84 Tiny Living and thought this would be a perfect time to share our favorite ways to decorate! Don’t worry, there’s no need to trim down your holiday spirit when getting your tiny house ready for the holidays. 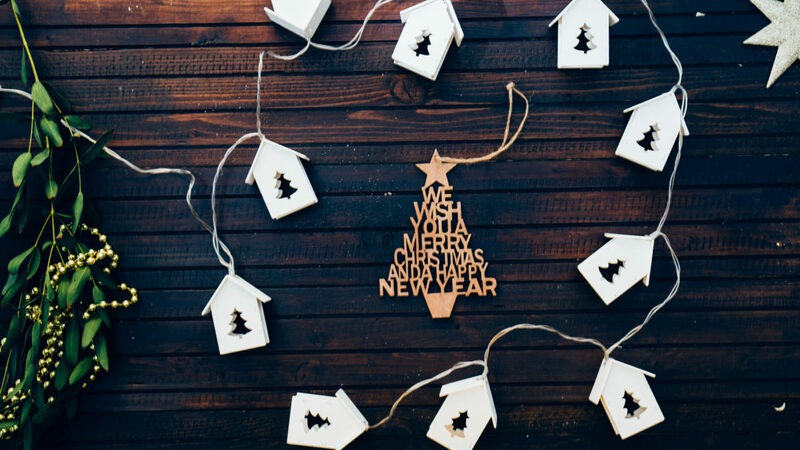 Keep it toasty and cozy with these strategic ways to help you bring on the holiday charm, whether it’s for your tiny, or not-so-tiny, home. If you are going for a minimalist holiday this year, consider a “Wishmas” tree instead of your traditional Christmas tree. A Wishmas tree is a small, tabletop tree that you string up your wishes on. Write down everything that you are wishing for, or grateful for, and tie them to your tree. Instead of opening gifts, you can unwrap your wishes for the new year and spend time focusing on what you are most thankful for in your life. If you prefer a more traditional holiday, buy a real Christmas tree, cut the top off to use in your house for your petite tree, and use the remaining branches to make a wreath for the front door. You can also create a greenery display for the tongue of your trailer. While you are outside doing that, hang up a clothesline for Santa’s red or green long johns and hat. We just love this idea from Barbara in North Carolina. You’d be surprised what a difference tucking some greenery, pine cones and holly into places does! The great thing about using live decorations is that once the season is over, you can return these items to the outdoors to decompose naturally, eliminating the need to find extra storage space for your decorations. Another way to decorate without using too many resources is to use felt, wrapping paper or recycled gift bags to create a festive book cover for your favorite coffee table book. If you are like me, you probably have more ornaments than room on your tree. 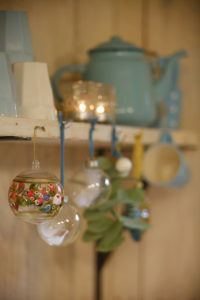 If so, string them up with some ribbon and hang them throughout your house. They look great hanging from backs of chairs or off of shelves. You can also grab a picture frame you aren’t using (or buy one second hand), paint it and string up a few ornaments with ribbon for a creative, one-of-a-kind window display. Consider displaying your festive dinnerware by mounting them to the walls. This way you can both enjoy them and have easy access to your plates when it’s time for dinner. If you aren’t using items that can be repurposed year-round, you will either need to find a storage solution or donate them after the holidays. That’s why getting creative and using dual-purpose items can be so useful. Also, consider what you can find at thrift or antique stores. There are usually inexpensive festive finds that can be re-thrifted once you are done with them. And after all of that, take some time to sit back with a warm drink and enjoy the season! Leave a comment below with your favorite way to decorate. And from all of us here at 84 Tiny Living, Happy Holidays!